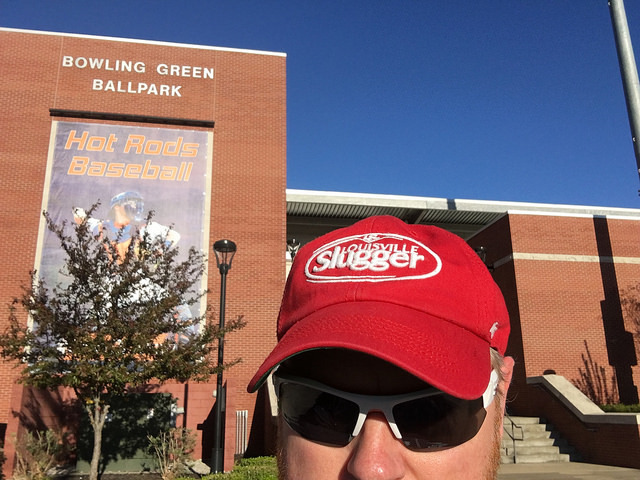 Bowling Green Ballpark-Bowling Green, KY: This was our first game here in Bowling Green, and I can honestly say it was a fun experience. 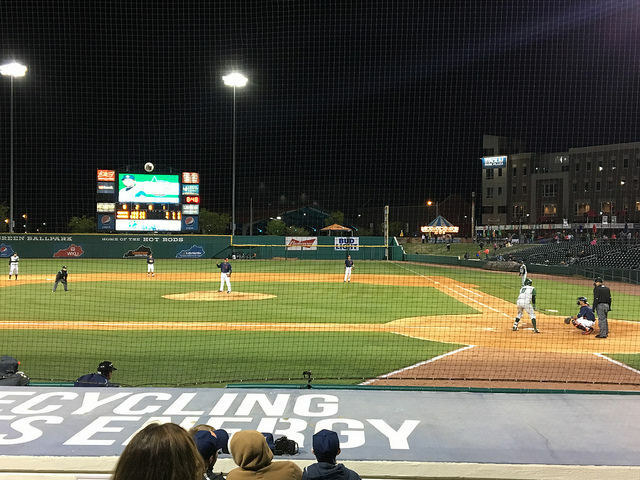 Bowling Green Ballpark is nice place to watch a game, and is snuggled right into the down town area. The only negative thing I can say about the ballpark, is that there is just so much netting, it was difficult to get good photos of the action. We had good seats, though, although I had to move around a bit to find a place to take a pic or two without the netting in the way. Brian was having a fun time, also, and we really liked meeting the Hot Rod mascots Axel and Roscoe. I was impressed with the mascots, they were very active through out the game and did a great job of entertaining and interacting with the fans. 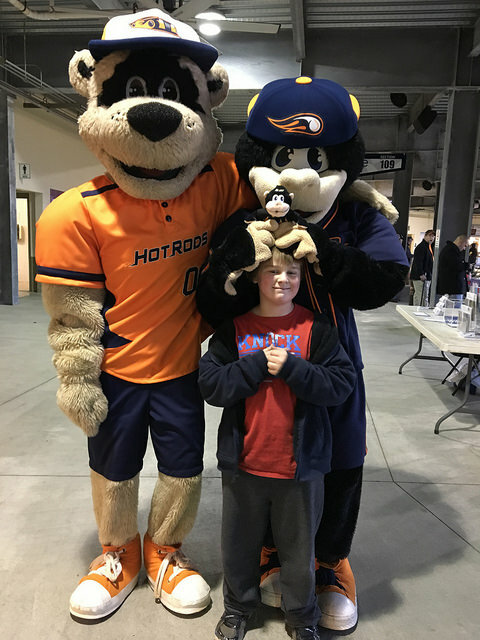 Brian with Hot Rods mascots Axel and Roscoe. Now, as much fun as meeting a bear and monkey that are apparently auto mechanics, the highlight of this trip was that Brian was chosen to help out with the announcing. 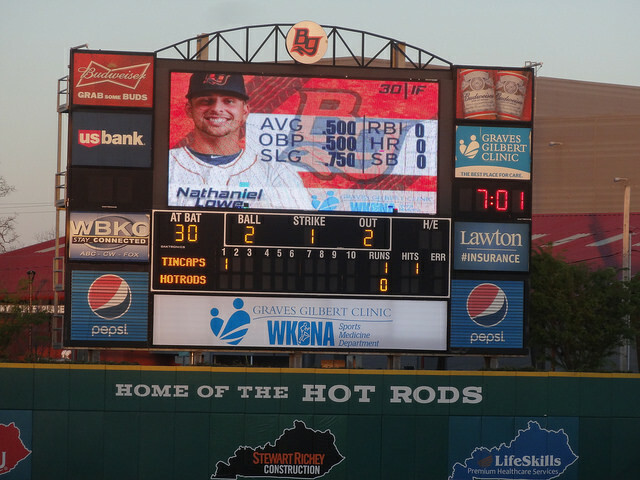 He was randomly picked by the Hot Rods staff, and during the fourth inning was able to announce the Bowling Green batters. 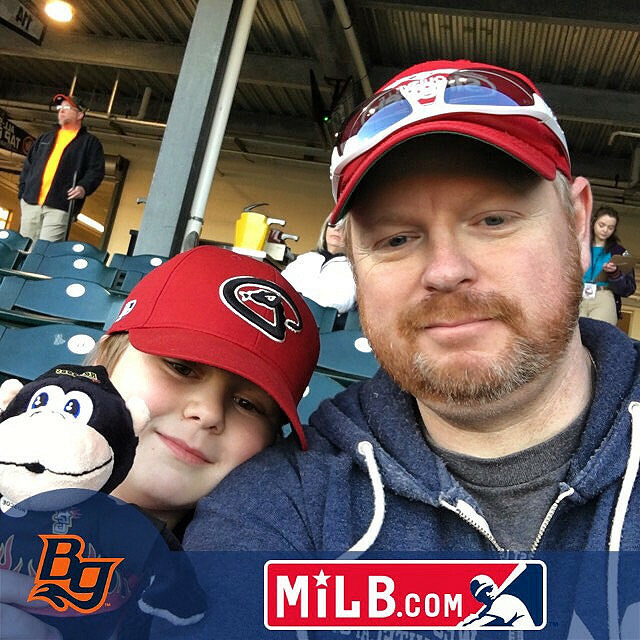 He was good luck, also, as the Hot Rods plated some runs during the inning. 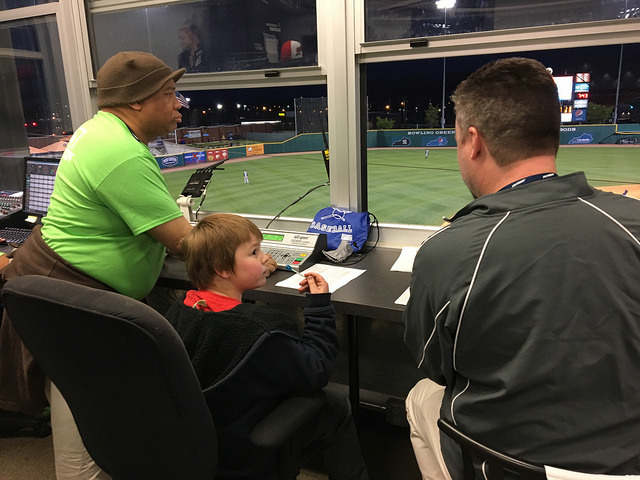 Brian was a little nervous at first, but the staff in the press box was very friendly and supportive, and he ended up doing a fine job! That was so much fun for him, but we almost forgot there was a pretty good ballgame going on, also. On the bump for Bowling Green, starting pitcher Brock Burke went three innings, giving up one hit, giving up one earned run, and striking out five. Roel Ramirez actual got the win, despite giving up four hits and two runs. 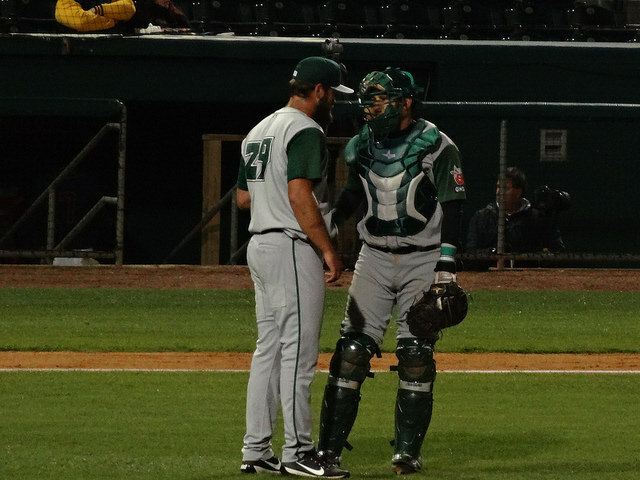 Spencer Jones earned the save, pitching two innings while giving up one hit and had three strike outs. Bowling Green was lead offensively by Nathaniel Lowe, who went 2-4 with two RBI’s, and Jesus Sanchez, who went 2-3 with two RBI’s and two runs scored. 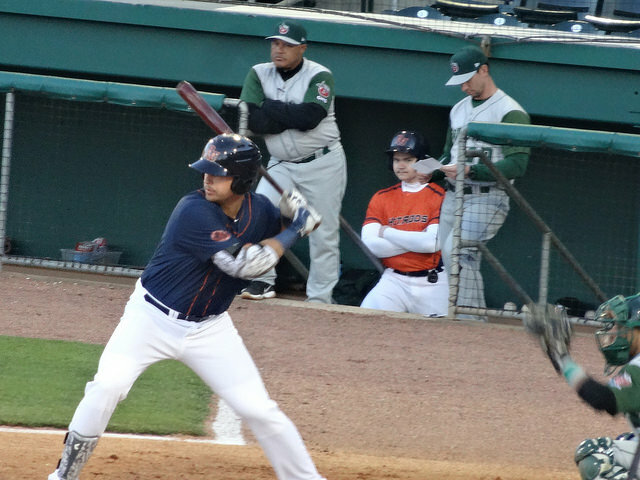 Final: Hot Rods 6, TinCaps 4. 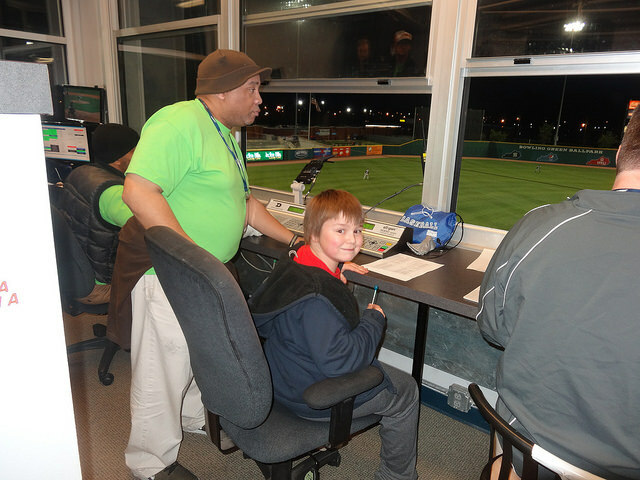 This was a fun night of baseball, and definitely makes us want to take another trip down to Bowling Green. There is also almost a limitless amount of things to see and do between Louisville and Bowling Green, also. So many National Parks and museums, it would take many trips to see and experience everything. 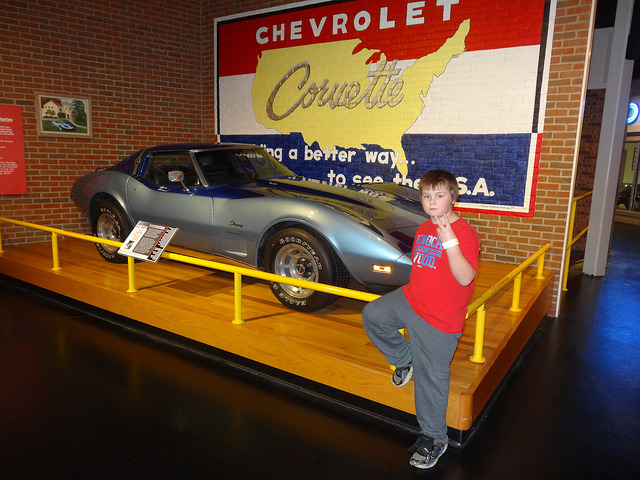 Below is a photo of Brian at the National Corvette Museum in Bowling Green. Just one of the fun activities we did that’s not baseball related. I love that Brian got to announce … how cool is that! He was nervous at first, but ended up doing great!